This may sound crazy, but handling the concerns of a neighbor could be the most difficult part of your job. Most contractors don’t do much to accommodate neighbors when building or remodeling a house. After all, they are not working for the neighbor. In fact, the neighbor really has no direct line of communication or dispute resolution with the contractor. 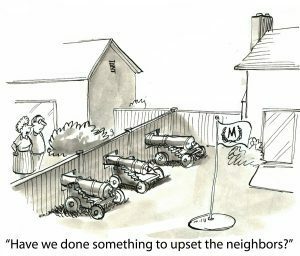 Even though this is the case, you may be surprised how much trouble a neighbor can create for you. Imagine a neighbor who does not like the construction crews starting at 7 or 8 am. They may call the building official every time your crew shows up 5 minutes early to setup for the day. That kind of hassle is not worth dealing with. Unfortunately, neighbors have been known to do that and much more. It is a amazing how an annoyed neighbor can slow down your progress. So what can you do to stop these things from happening? The key is communication. Not just during the job, but before you even start. 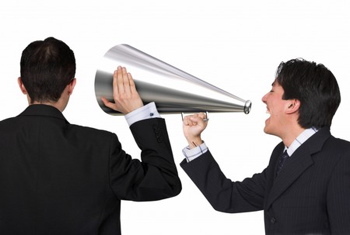 Contact the neighbors of the home you are working on and let them know what to expect. Tell them about your daily work schedule. Let them know about how long you anticipate being on site. You might consider letting neighbors know before any demolition begins on a renovation project so they can choose to remain at home or take a short vacation during the dirtiest phase of the project. In the past, I have made a point of informing neighbors ahead of time that there will be a lot of big trucks all day and that debris, dust, and noise will be high on that day. By giving them a week’s notice, some neighbors actually opted to take a short vacation so they would not be around for the mess. When they got back, the site was clean and the demolition had no negative impact on their lives. Another to keep in mind, if you are a contractor, is that a little preemptive communication can please a neighbor so much that you may find yourself working for them in the near future. Because most contractors don’t bother to even introduce themselves to neighbors, let alone warm them about the impending process, the neighbors are likely to be impressed with your up front and caring approach. Nothing like starting with a small renovation only to secure two more jobs on the same street! Don’t underestimate the importance of having a good relationship with your neighbors or the neighbors of a client. This is especially true if you are an owner builder. After all, you will have to live next door to them long after the rest of the subcontractors have moved on to another job. Create a good relationship and your job (and post job life) will be much easier and more fun. Roselle, I’ve been a contractor/remodeler for 40 years. Adobe, strawbail, heavy timber and Victorian restorations. I’ve never heard of the FSBO. What is that? Hi Ed. I think that message was spam. I deleted it. FSBO is “for sale by owner” in most cases, and was not relevant to the post. This article is a great reminder of the Golden Rule to, “Do unto others…” A friend who worked with my daughter told her that, “People don’t often mean to be rude, but they may often engage in thoughtlessness, or thoughtless behaviour.” Thanks Andrew!